Gazing on it today, a picturesque shambles of ruins and weeds, you would hardly guess that the Forum was the symbol of civic pride for 1,000 years. 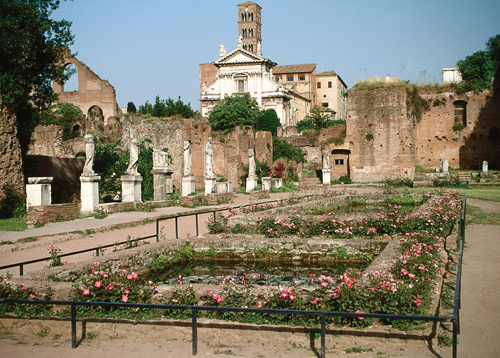 Its humble beginning, more than 3,000 years ago, was as a swampy cemetery for the original village on Palatine Hill. Gradually it rose, ever more glorified, as Rome’s power grew. After the marsh was finally drained off in the 6th century BC, it took on its central role in the life of the Republic. 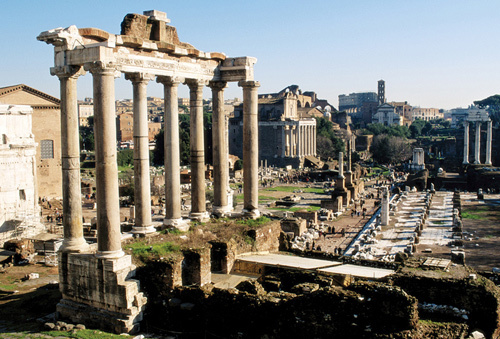 The Forum showed its most elegant face starting with the reign of Augustus, the first Roman emperor, who is said to have turned the city from brick to marble. 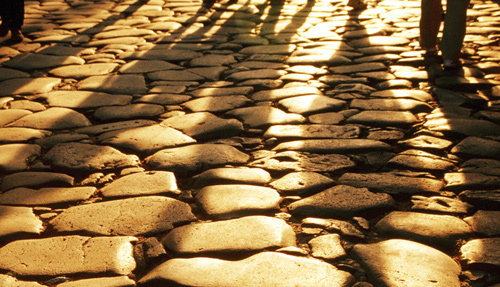 You can access the Forum from Via Dei Fori Imperiali. However, for a great view of the whole site, enter from one of the high points at either end. From the north-west end, begin on the Capitoline (to the right and behind the huge, white Victor Emmanuel Monument) and take the stairs down from Largo Romolo e Remo. 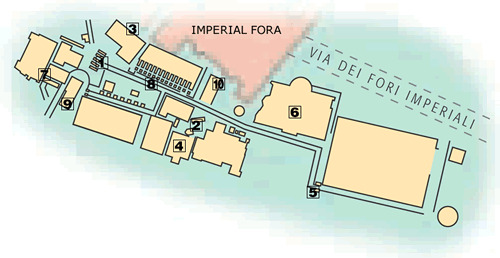 From the southeast end, start at the Colosseum and climb the small hill just to the northwest. Enter by the Arch of Titus, which is also near the main entry gate to the Palatine. The only option in the immediate area for drinks and snacks is one of the mobile refreshment vendors. For something more substantial, there are plenty of cafés and restaurants on Via Cavour. In summer, it’s best to visit the Forum either early or late in the day, to avoid the intense heat. This well-preserved triumphal arch celebrates the emperor’s Middle Eastern victories. 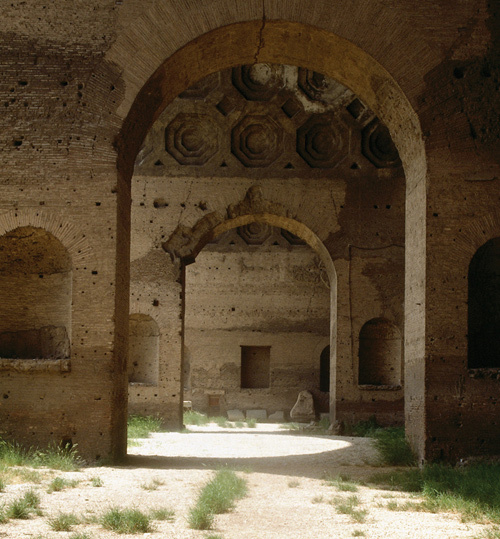 It was erected in AD 203 by his sons, Geta and Caracalla, then co-emperors. 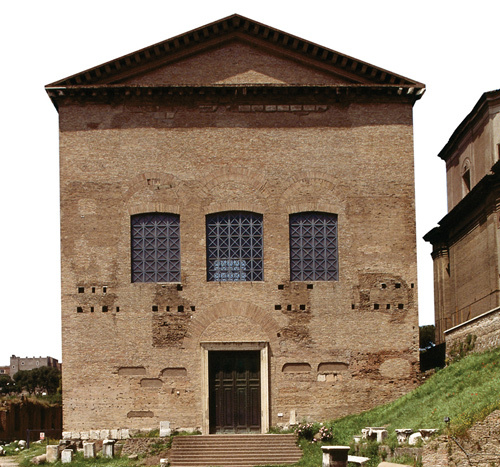 A graceful round temple and its adjacent palace were the centre for one of Rome’s most revered cults. Noble priestesses tended the sacred flame and enjoyed the greatest privileges. The 3rd-century-AD Senate retains its original polychrome inlaid floor, its risers, where the 300 senators sat in deliberation, and the speaker’s platform. For 2nd-century views of the Forum, examine the large marble reliefs, showing Emperor Trajan’s good works. Three Corinthian columns remain of this temple to the Dioscuri – twin brothers of Helen of Troy and sons of Jupiter and Leda. 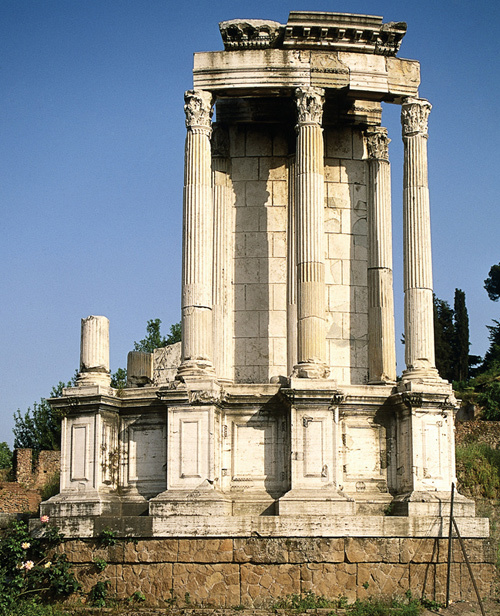 The shrine marked the spot where they miraculously appeared in 499 BC to announce a crucial Roman victory. 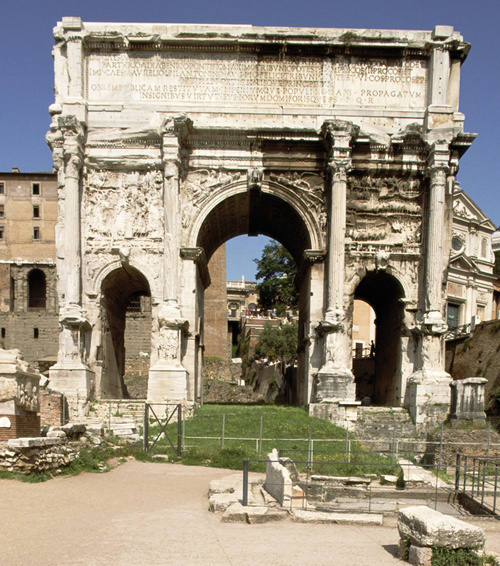 The oldest extant arch in Rome was erected in AD 81 by Emperor Domitian to honour his brother, Titus, and his father, Vespasian, for putting down the Jewish Revolt. Reliefs show soldiers sacking Jerusalem’s Holy of Holies and taking sacred objects, such as a golden menorah. Three vast, coffered barrel vaults proclaim the Forum’s largest structure, built around AD 315 and used as the legal and financial centre of the Empire. Until 18th-century excavations were undertaken, these graceful corner columns (AD 79) of the temple to a former emperor stood mostly buried beneath centuries of detritus. Paved with broad, flat, black basalt stones, Rome’s oldest road wound from the Arch of Titus through the Forum and up to the Capitoline. Republican heroes staged triumphal processions here, but it degenerated into a hang­out for gossips, pick­pockets and other idlers. Eight grey-and-red Ionic columns constitute what’s left of this temple (also the state treasury) to the ruler of agriculture and of a mythic “Golden Age.” Saturnalia, celebrated each December, was very similar to modern-day Christmas. 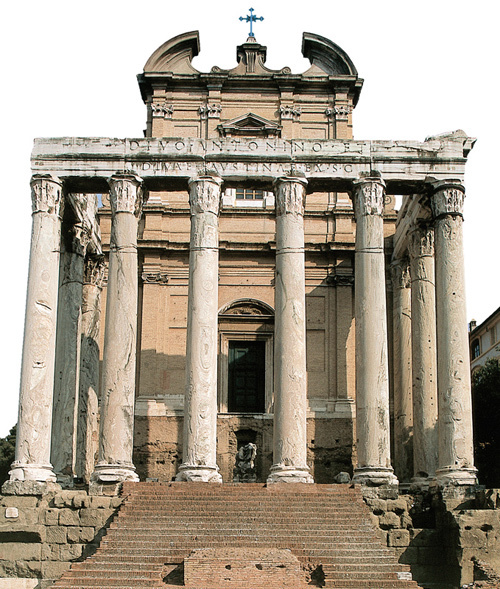 Dedicated by Antoninus Pius in AD 41 to his deified wife Faustina, this is one of the best preserved temples. With its Baroque-style top-knot, it is also one of the oddest. Note the carvings of griffins along the side frieze.